Research has shown that noise in a healthcare environment can have a detrimental effect on both patient and staff well-being. 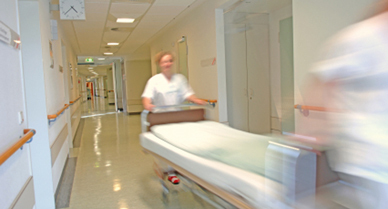 Yet many noise issues in hospitals, healthcare centres and care homes are not just tied to the building fabric; they can also be helped by achieving a low noise culture. Examples such as the Montefiore Medical Centre in the US and East Kent Hospitals have shown how Silent Hospitals Help Healing (SHHH) campaigns can reduce noise levels through activities, behaviour and equipment. These programmes only really work when staff are fully involved, committed and take ownership of noise and vibration levels within their area of responsibility. It was on this basis that we worked with Salisbury NHS Foundation Trust on an 8-week noise management pilot study. Provide evidential deliverables that can demonstrate to stakeholders (such as the Trust's Board and CQC) that improvements have occurred which may be monitored on an ongoing basis. We installed a SoundSign device in 3 ward and nurse station locations. One of these 3 locations also had a simultaneous noise measurement sound level meter which provided objective comparable noise data. With the sound level meter moved to an alternative position for comparative measurements in a different environment. Analysing the data and reporting on the results, with recommendations for ongoing noise level management and control. You might also be interested to read our blog post Is noise, or silence, important in healthcare?